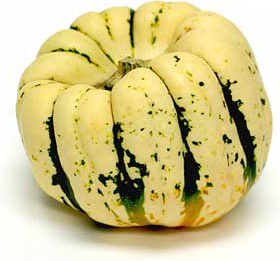 The Dumpling squash is a small winter variety, and averages four inches in diameter. The size of an extra large apple with a flattened top, it usually weighs less than one pound. The skin is most often white, mottled with green, yellow and orange markings. Bold, scalloped, hollow lobes outline this squash, giving it a miniature pumpkin appearance. The smooth-textured, tender, orange flesh offers a sweet flavor. The Sweet Dumpling squash is available fall through winter. This variety, also known as sweet Dumpling squash and of the genus Cucurbita pepo, vigorously grows on rather short vines. It takes between ninety and one hundred days for this squash to mature. The plants love a sunny location, a rich well-drained soil and moderate moisture. Dumpling squash requires no curing to store for three to four months. Recipes that include Sweet Dumpling Squash. One is easiest, three is harder.